The Academy Awards did a lot for the Alzheimer’s community last night. 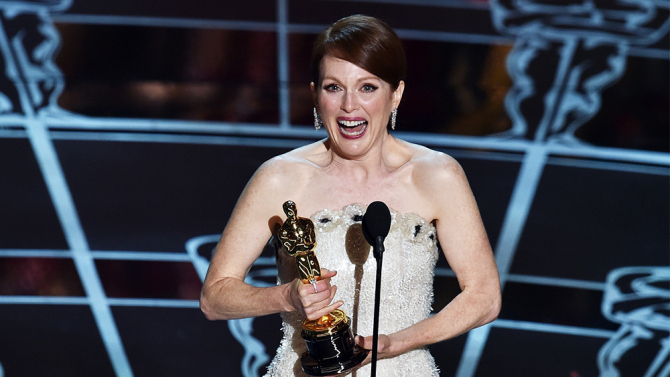 Leading up to the big awards show, there was plenty of buzz from the Golden Globes to the SAG Awards, on Julianne Moore’s performance in Still Alice; a movie about a renowned professor’s battle and journey with early onset Alzheimer’s disease. Based on the New York Times bestselling novel by Lisa Genova. Still Alice, many of us hoped would instill conversation and action to find a cure and bring awareness to this disease. Well conversations started, and Moore scored the win for her performance as Alice. She has given many great performances, stretching herself in roles that ranged from playing a lesbian mother in The Kids are Alright to introducing herself to younger audiences as President Alma Coin in The Hunger Games: Mockingjay Part 1; but her first Oscar win comes from playing a woman with Alzheimer’s, a most stigmatized and non-curable disease….how about that! As Moore’s name was announced I couldn’t help but tear up. Her win was a win for us all. For those with Alzheimer’s and those caring for loved ones with the disease. Her work was our win, our hope that finally Alzheimer’s is getting it’s due, it’s grace, it’s notice and as she said it’s shine. I believe this win gives people the permission to talk about Alzheimer’s freely and not just behind closed doors. This Oscar win says I see your great performance and I bring attention to what so many people are dealing with every day. Well at least that’s what I hear. Those who are advocates already had the torch lit, this new light gives us more fuel for the fire. It’s time to take more than our 15 minutes. Because the facts are someone gets Alzheimer’s every 67 seconds. A woman in her 60’s is twice as likely to get it as she is to get breast cancer. Women make up 65 percent of all those who get Alzheimer’s and they’re nearly two-thirds of all the caregivers in this country. And Alzheimer is the sixth leading cause of death and the only one without a cure.